​This is a rather special photo of an ordinary GWR 0-6-0 goods engine. In fact, it's an Armstrong or 388 Class engine built at Swindon in 1868 and withdrawn in August 1916. With several other Armstrong class 0-6-0s it was sent for service in Salonika but never returned. Its connection with Box is two-fold: the photo was taken at Box Station and the photographer was Rev Vere Awdry, father of Rev Wilbert Awdry, the author of the Thomas the Tank Engine books. ​We can date the photograph to the years 1916-17 as the engine was shipped to Greece in 1916 and the Awdry family moved to Box in 1917 having previously lived in Pickwick where the Rev Vere Awdry was vicar of Hartham Church, a private church on the Hartham Estate. ​The story of the Armstrongs is interesting. 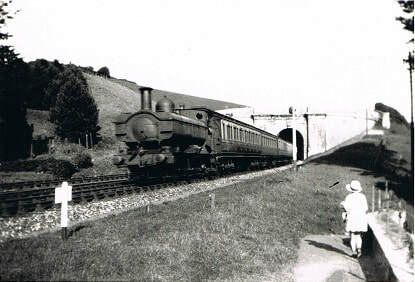 They were built as broad gauge after 1884 and converted to standard gauge in 1892. This engine, number 447, was built mid-way in the production of the engine class. In the First World War two Armstrong engines were sent to Salonika in 1916 and sixteen the following year. 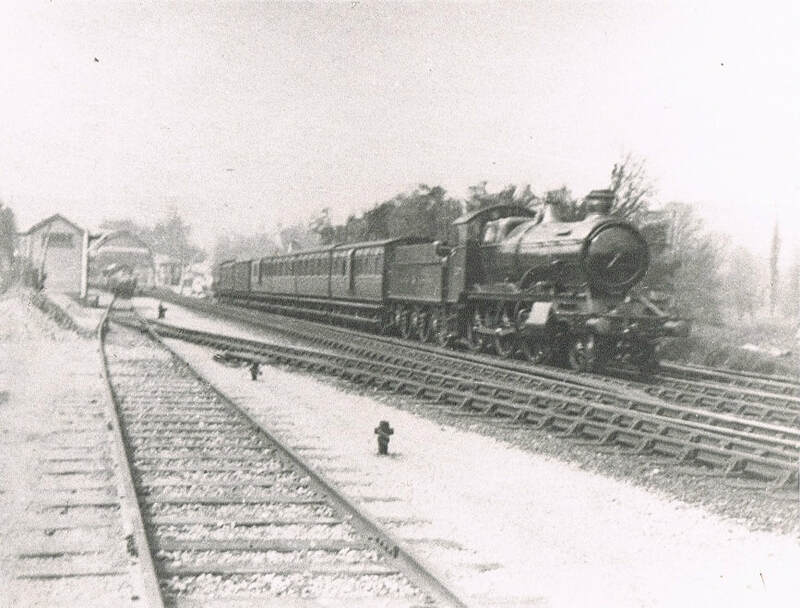 Of the second batch, half were lost at sea when the cargo ship was sunk; four entered service with the Ottoman Railways after the war and four returned to GWR. The war front in Thessalonika was one of the most wide-ranging campaigns in the First World War. The front line was intended to protect Serbia, Greece and the Dardanelles from invasion through Bulgaria by Turkish forces supported by Austro-German troops. The front covered a defensive line of 250 miles manned by 600,000 Allied troops in difficult terrain. It was vital to bring supplies to the line and mule trains in 1915 were replaced by newly-constructed rail lines a year later; hence the need for the Armstrongs. The war was bogged down and the situation worsened over the summer months when malaria became rife in 1917-18, the worst outbreak in Europe at the time. Living conditions deteriorated with men camped in bivouacs or tents and the British Salonika Force (BSF), with fewer troops than other Allied countries, lost a total of 7,000 men. These were buried in various war graves in the area, many un-named. Box lost three men in the Salonika Front: William James Franklin, Frederick John Gingell, and Frederick George Smith, who you can read about in the article at Never Forgotten. Whilst fighting occurred in mainland Europe, life in Box continued for newcomers like Rev Vere Awdry. He was intrigued by his new residence and recorded it in photographs. These photographs were given to me by Rev Wilbert Awdry back in the 1980s. ​The photo above shows the stoneyards at Box Station in active use with an un-named Bulldog class 4-4-0 engine waiting in the stone wharf siding. In peacetime the engines were mostly used for passenger service but this engine appears to have been commissioned to carry goods (possibly for military purposes) to Bath and Bristol. The photo below left is of number 3353 Camel a Bulldog class engine built in Swindon. 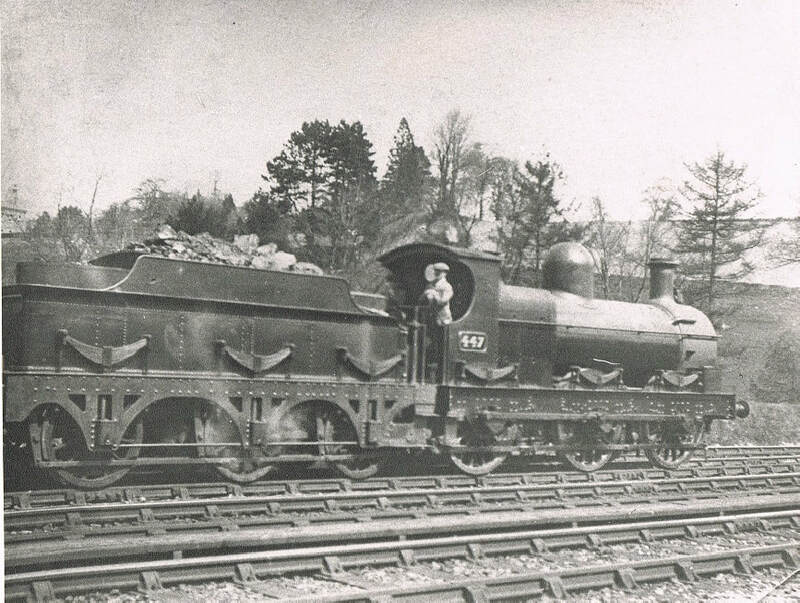 This was the first of the class to be fitted with a domeless boiler. The Camel wasn't named after the animal but from the River Camel in Cornwall, bordering Bodmin Moor and part of the GWR line. The photo below right is a 0-6-0 Pannier Tank engine with a stopping train, which some readers may recognise as Duck the Great Western Engine, the fictional green locomotive on the Isle of Sodor in the Thomas the Tank Engine series. I’ve had correspondence with Rev Wilbert Awdry's oldest daughter and his son, Christopher Awdry, about the identity of the little girl by the bridge but they couldn't help. Does anyone out there recognise a relative from the 1910s or 1920s? By the time of these photographs Box Tunnel was showing signs of wear and tear from steam, smoke and the traffic of trains through it. Flooding and rockfalls were a constant menace and daily inspection was needed to ensure traffic could pass safely. The photo below shows a tunnel inspection gang with their equipment. Despite the name permanent way, the railway lines required constant maintenance. The line had been converted from the original broad gauge to a mixed track in 1861 and the broad gauge line was removed in 1892. The amount of use of the lines in Box Station for main line engines, passenger and goods traffic and the heavy stone trucks meant that additional work was needed on this part of the track. 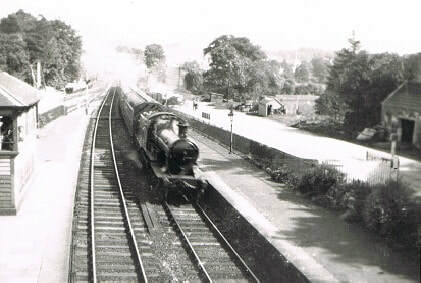 Rev Vere Awdry captured this in the photographs below. Like any railway enthusiast, the interest in steam engines encouraged Rev Vere to take photographs of trains coming through Box. 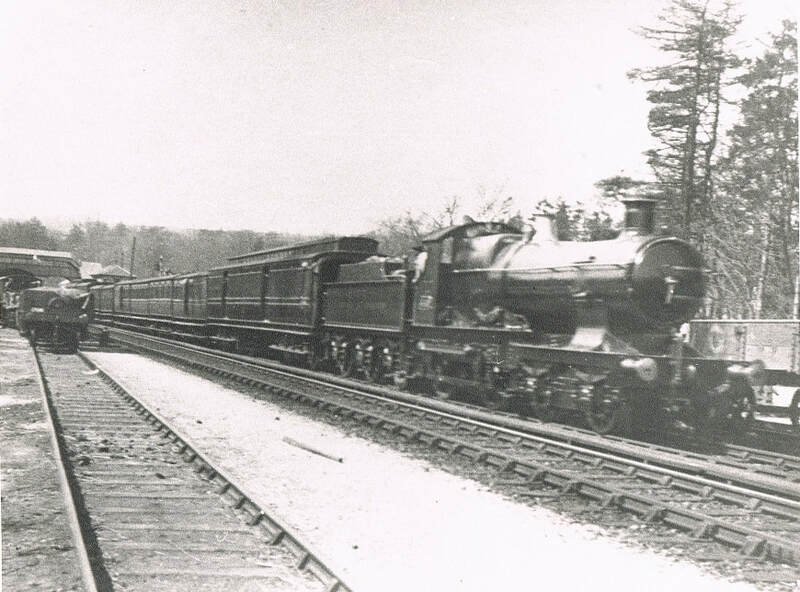 Below left is a 4300 class 2-6-0 engine with a passenger train and below right is an un-named Bulldog class 4-4-0 travelling towards Chippenham. Rev Vere Awdry died 90 years ago in 1928 and Rev Wilbert himself died in 1997, having last visited Box in about 1991 to open St Thomas à Becket Church fete. His surviving son, Christopher, unveiled the blue plaque outside of Lorne House in honour of his father, which I managed to photograph. Rev Wilbert Awdry and his wife Margaret moved to Rodborough, Stroud, where Wilbert lived for his last thirty years. 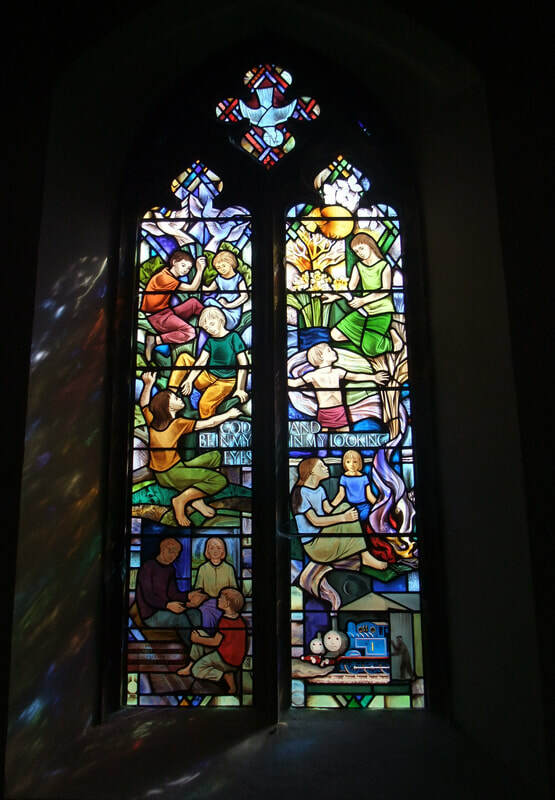 They are still remembered there in a stained-glass window seen below, which includes Thomas the Tank Engine looking rather unhappy as he’s put in the engine shed by a sad clergyman. Of course, the Awdry family epitaph in Box will always be the Box Tunnel.